Product #31441 | SKU 19791 | 0.0 (no ratings yet) Thanks for your rating! Universal Tablet Holder for different models. The Universal Tablet Holder can be adjusted variably to accommodate different tablet sizes without needing tools and holds the devices securely and effectively for many different situations. Be it on stage, in rehearsal rooms or at home - thanks to the strong clamp element with the ergonomic clamp screw the holder can be attached to any tube up to 30 mm quickly and easily. 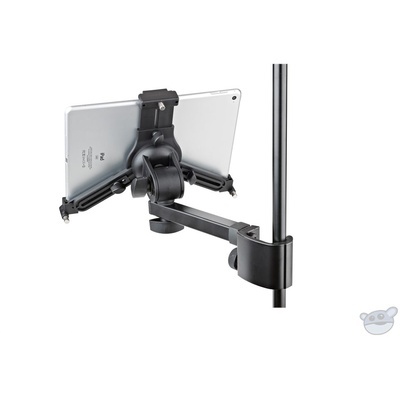 The individually adjustable support arms can accommodate the use of tablets ranging in height from 220 to 331 mm and width from 128 to 232 mm (for example iPad, iPad Air, iPad Pro, Amazon Fire HDX 8.9, Samsung Galaxy Tab from 9.7, Google Nexus 9, Asus Transformer or Microsoft Surface as well as Surface Pro). The depth of the tablets can vary between 5 and 11 mm. For the first use of the tablet holder the support arms settings are made by adjusting the clamp screws to the size and depth of the tablet. For other uses the tablet can be attached and detached quickly and simply through a snap lock. A handy wing nut allows one to adjust the angle, so that each user will easily be able to find their ideal individual position. The tablet can switch between portrait and landscape positions. The tablet is kept in place, there is no danger of the tablet switching position by itself.